Nowadays, it’s not unusual to meet your life partner online. But it’s more unique to make the web the focus of your wedding. 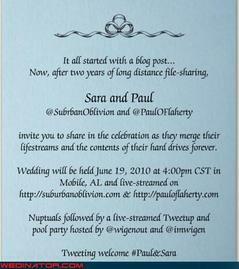 Paul and Sara’s Twitter nuptials were live streamed on their own blogs and followed by a Tweetup. He vowed ‘to be beside you online and off… to infinity and beyond’, and she promised ‘to follow you and friend you’. The groom even managed to get a no-complaining clause about Call Of Duty in there. Read the full story and see the video at Wedinator.com.